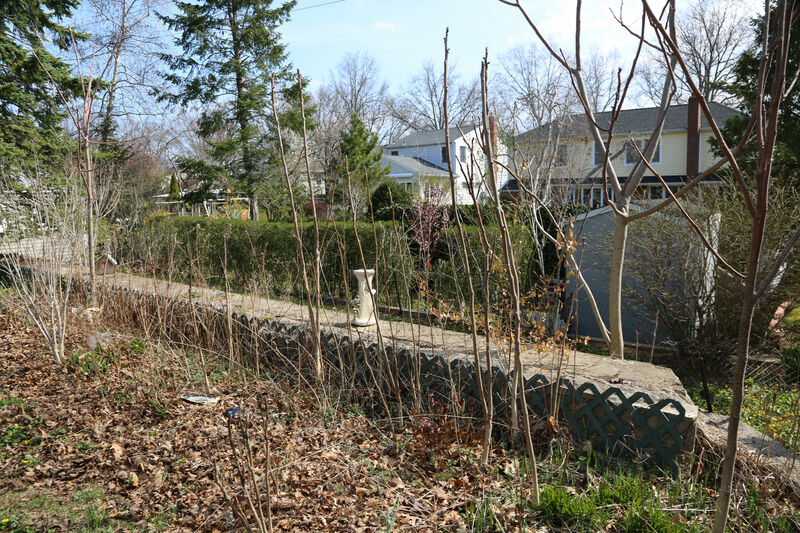 Information and images on the loss of this Motor Parkway treasure are documented below by Bill Bellmer (Garden City Village Historian), Mike Z, Art Kleiner and Dave Russo. 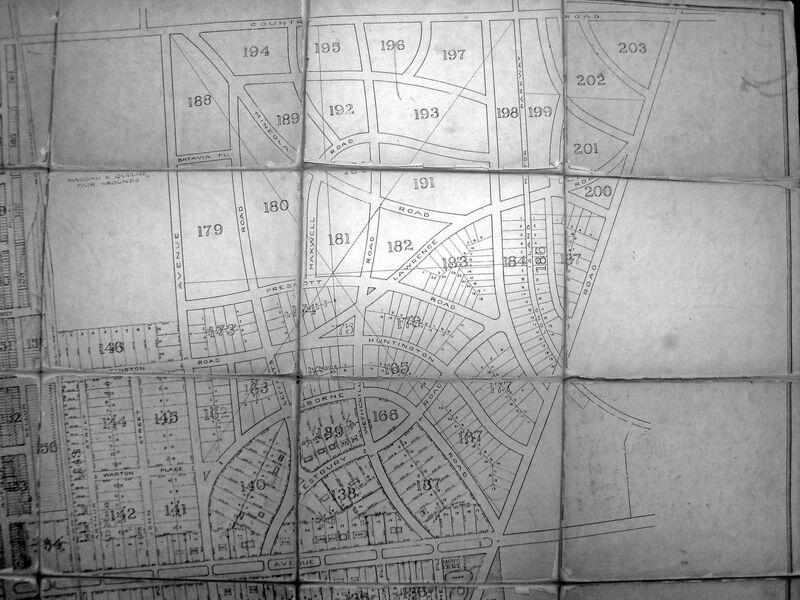 Bill Bellmer (Gaden City Village Historian): This 1914 map in the Village Archives shows the original proposed street layout for the northeast Garden City area. 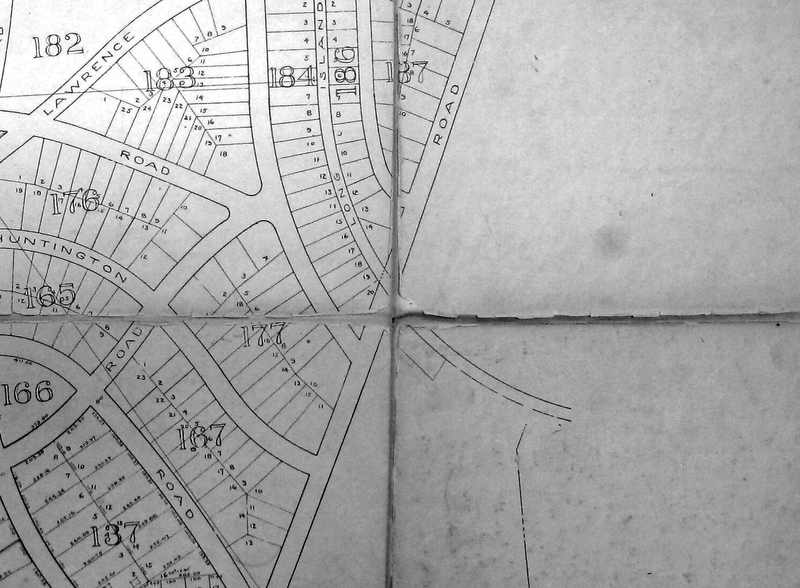 Bill Bellmer (Gaden City Village Historian): Note the proposed "Lawrence Road" crosses the LIMP at the correct angle at the location of interest. I would conclude that Sam Berliner III is correct - that the Garden City Company didn't want the section of the Village northeast of the LIMP to be isolated, but it wasn't yet necessary to build the actual bridge. They even restricted the LIMP ROW to 50 feet width within their area instead of the typical 100 feet. The photo was taken at the scene of a car accident by Motor Parkway motorcycle patrolman Thomas Zinzi. His motorcycle can be seen on side of the Motor Parkway. 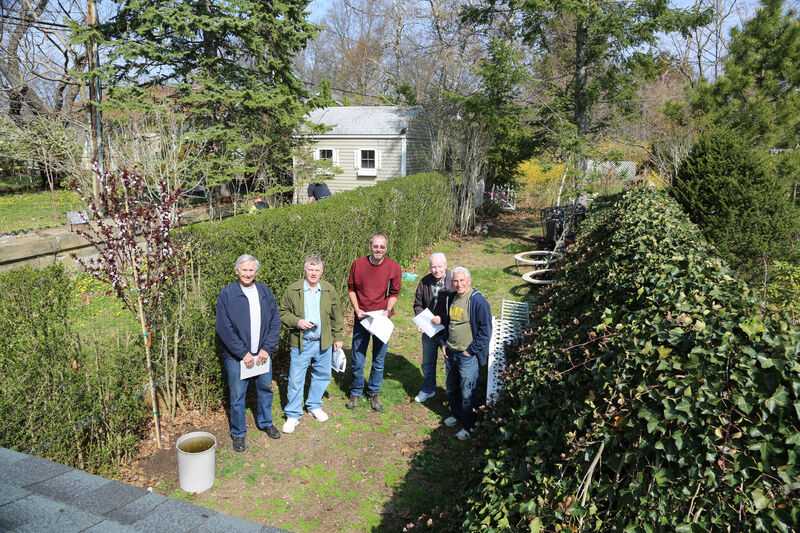 Members of the Long Island Motor Parkway Preservation Society explored and documented the still standing western wall of the Mayan Ruins Bridge in April 2017. 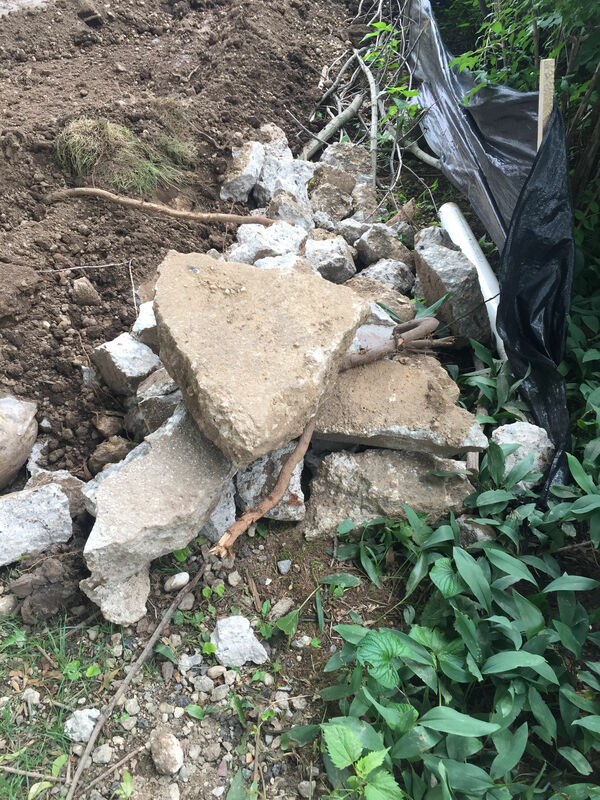 In December 2017, Art Kleiner took these images after receiving the below email from his friend Mike Z,, whose property includes the eastern wall of the Mayan Ruins. Mike Z: They took the wall down to a foot or so below the surface. There is still the 10 feet or so left below ground level and I am sure the roadway below also. 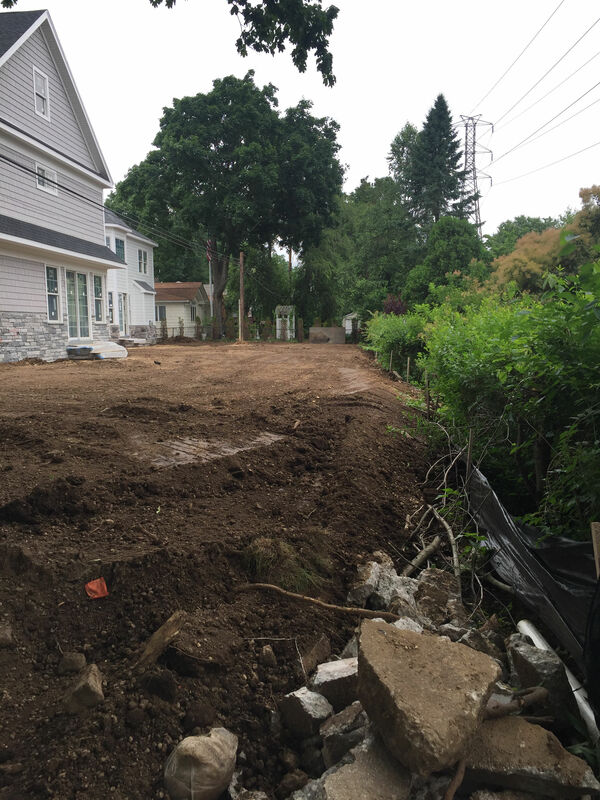 All the concrete that was broken up was taken away or mixed with the foundation of the old house that was removed. It is a shame that it was not a historical landmark that could not be touched. In a conversation with the builder, he was aware of what it was and told me that he could take it down since "there was no historical restrictions" on it. Dave Russo: Drove by the former Mayan ruins location today. As you can see from these photos, the wall has been taken town. 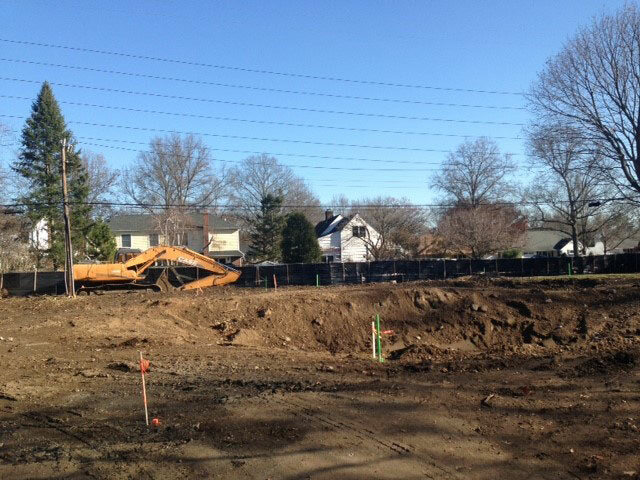 Two new houses are being built on the property. 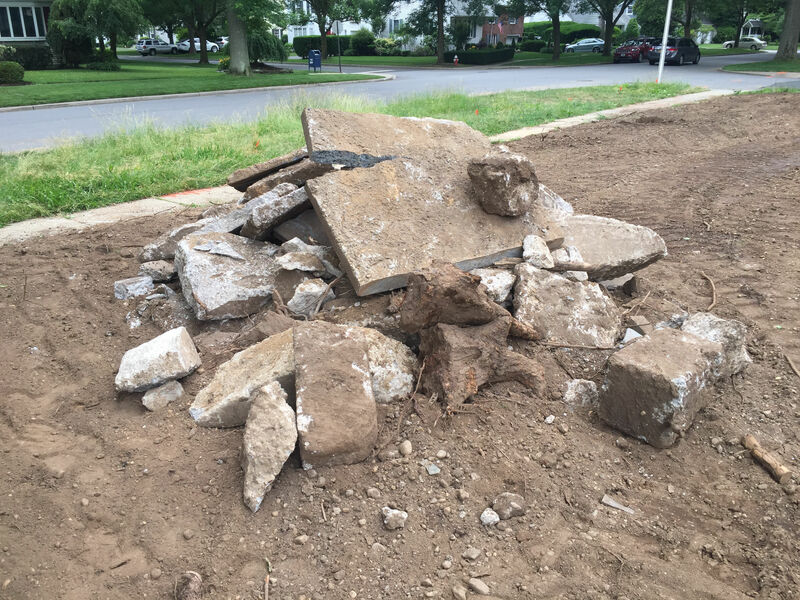 They dug up the entire backyard and it appears as though these are road fragments....which might be evidence that the road was not 15 feet underground. And perhaps these walls were not the bridge abutments but just that wall as per your old pics that you have put on the site. 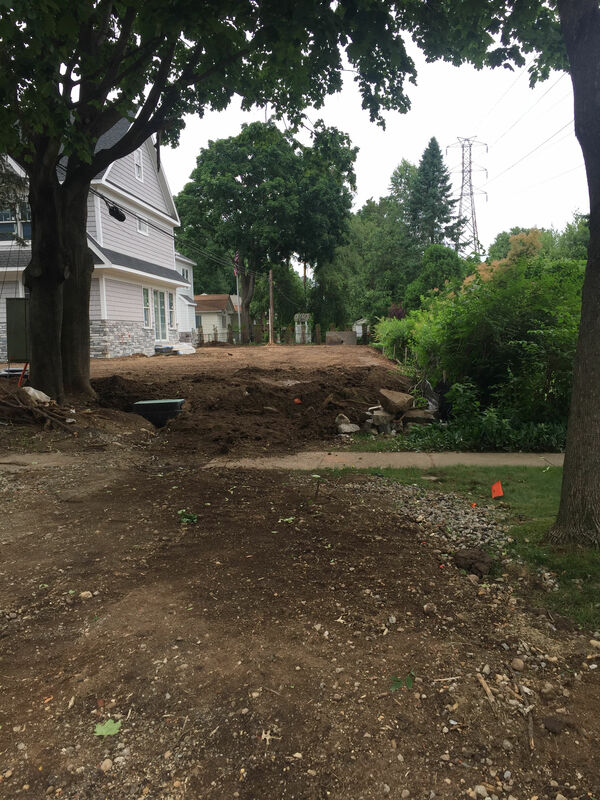 Art Kleiner: My friend Mike told me it took the builder three days and a macho machine to remove the west abutment, and just below the surface in order to soil over it. He hadn't expected it to be that tough and so decided not to go any further. 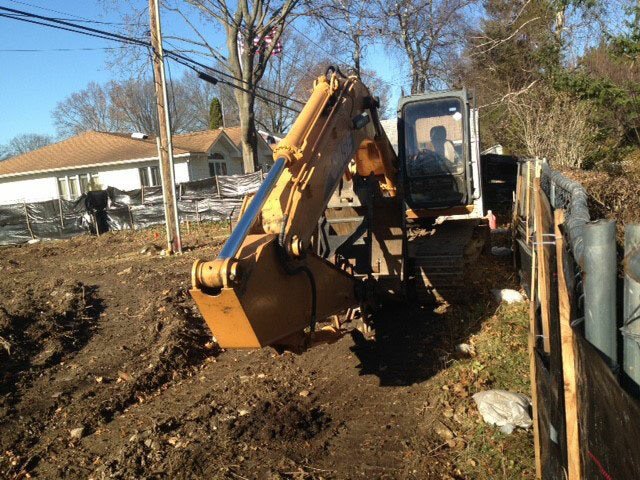 Art Kleiner: My friend Mike told me it took the builder three days and a macho machine to remove the west abutment, and just below the surface in order to soil over it. He hadn't expected it to be that tough and so decided not to go any further. The former location of the western wall is circled. The East Abutment has yet to fall, still vined and tall. Residents of the new homes should be relatives or friends, those house’s are quite close to each other. Look at the old pictures. From the top of the abutment that first “lip” is very thick. Look at the newer pics. That same lip is nowhere near as big/thick. There is no way around that. I dont think this was the bridge abutment! I think this was the wall that was clearly on both sides. 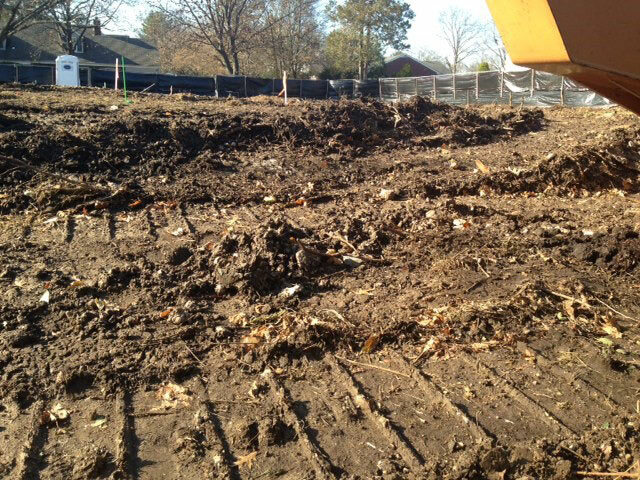 I think the pics I submitted show the LIMP remnants that they dug up. The fragments are right along the ROW. They didn’t dig down 15 feet. This LIMP was not far under the grass. I admit it’s very ironic that both sides of the wall remain(ed) on both sides at that location. The only way to prove this is to get out the shovels one day and go Art’s buddy’s house on the eastern side and get digging! Dave - When the crew visited last year, there was evidence that the top lip of the west abutment was trimmed down at some point. You can see the rough cut on the photo where Steve is standing, and only the half closer to Steve was smoothed down. Weird indeed. 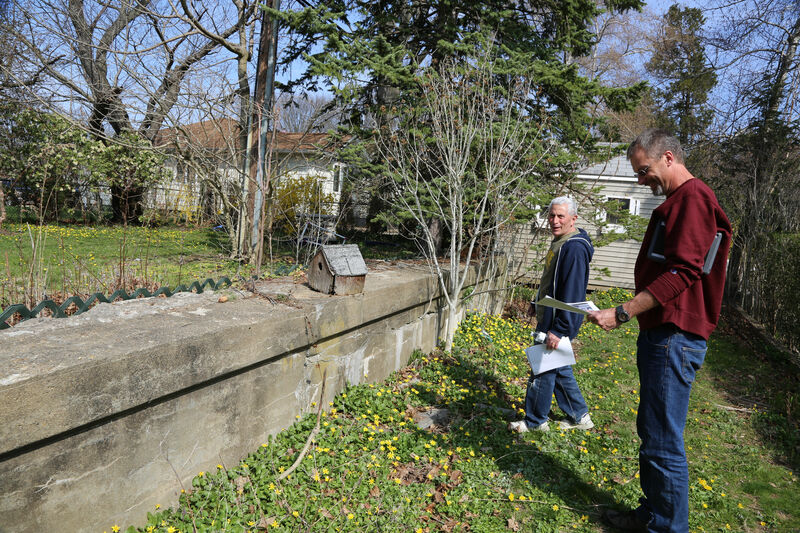 Sam III….The lower walls that Dave is explaining about are shown on the 1928 photos, extending on each side of both abutments. You realize how long each lower wall is after zooming in. 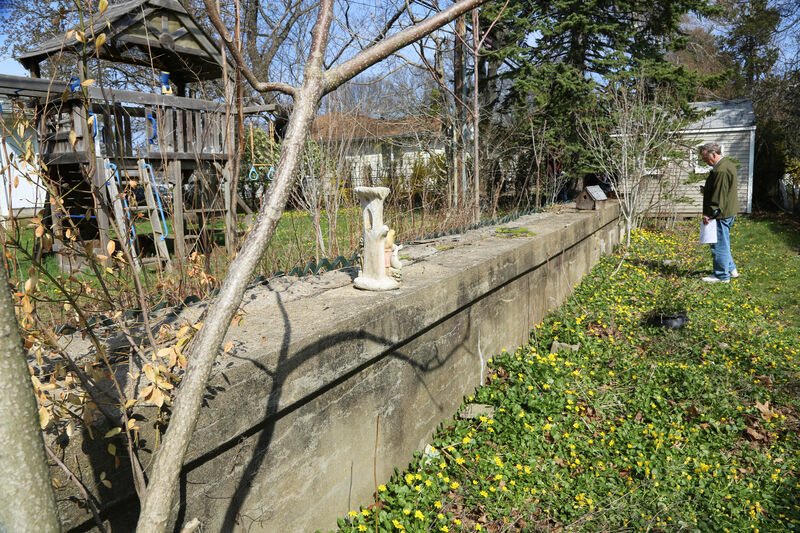 The lower walls on the east abutment are visible presently in the r/o Pell Terrace. So the east side is MUCH LESS buried under than the west side. Dave has been steadfast on his thoughts about the west abutment, and it’s FINALLY making sense to me. I’m also keeping in mind that both abutments were not straight across from each other, the entire west abutment is further south than the east one. Brian - The retaining walls of the east abutment are now exposed? Both? Is this due to the construction going on? 1) Why in the world would anyone SHAVE the abutment? How it survived in the first place is a miracle, but if a home owner was going to spend money to “work” on their ruins they would just get rid of them! Nobody would pay to just shave them down a bit and leave them there. 2) I just sent Howard a video from our 2016 Vanderbilt Day. Look at the first second of the video—-the 45 degree angle wall that meets the flat wall perfectly. Look in the old pictures, the 45 degree wall perfectly meets the abutment at the TOP of the abutment. As you can see from this pic/video, the (then) existing 45 degree wall meets this CURRENT top spot perfectly. So that to me is PROOF that this wall/abutment has absolutely NOT been shaved down. The 45 meets the top perfectly and if the top was shaved that would NOT be the case. Again it’s also clear to me that these are LIMP pieces, lots of them, in my pics. I think we can all agree the contractors did not dig down 10-15 feet to dig this up! Dave Russo has added a 2016 video of the Mayan Ruins. Look at my last picture above, taken from the street looking northward directly up the ROW. You can see THE LIMP fragments EXACTLY there in the ROW exactly where I believe they would be in this location depth wise. This is just irrefutable evidence! I feel like an attorney providing all of this proof against my defendant SBIII. * Image- This is an undated picture of the abutments in question…Art must have provided this aerial to Howard because I’ve seen it on the VCR website. Nice, close up south view. There’s the Russell Rd home that was recently demolished. The road that dead ends quite abruptly to the LIMP s/o the house has to be Transverse Rd. The offset positioning of the abutments show how the proposed road would’ve been from the N/E to the S/W. * 2010…2 left images show the west abutment. 2 right images show the east abutment. Top right image is what I think is the extreme end of the NORTH LOWER WALL ( remember the “roundish carving”? No word from Art, yet ). Lower right image was taken closer to the shed ( which was then brown ). Even with all the vines, the actual abutment is evident. * 2016…Top left image captures mostly the NORTH LOWER WALL that extends from the EAST ABUTMENT, but showing the EAST SIDE of the wall ( I remember the electric conduit that is along this wall below the vines when we were all there ). You can see the up rise of the actual abutment closer to the shed ( then brown, now blue ). 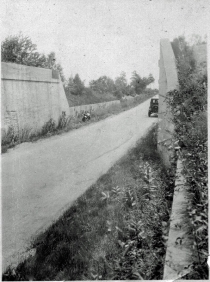 The 3 other images are various views of the WEST ABUTMENT. The final 2 images were taken behind & parallel with the BLUE SHED ( east abutment ). The cement/concrete looks new/fresh at the end of the wall ( PARALLEL image, after the CREASED section ). I agree with Brian, Sam, and the 1928 photos. I’m estimating the roadway is 12ft below the surface at the abutment, and it’s still there along with the retaining walls. No need to remove anything below if it’s just going to get buried with dirt. 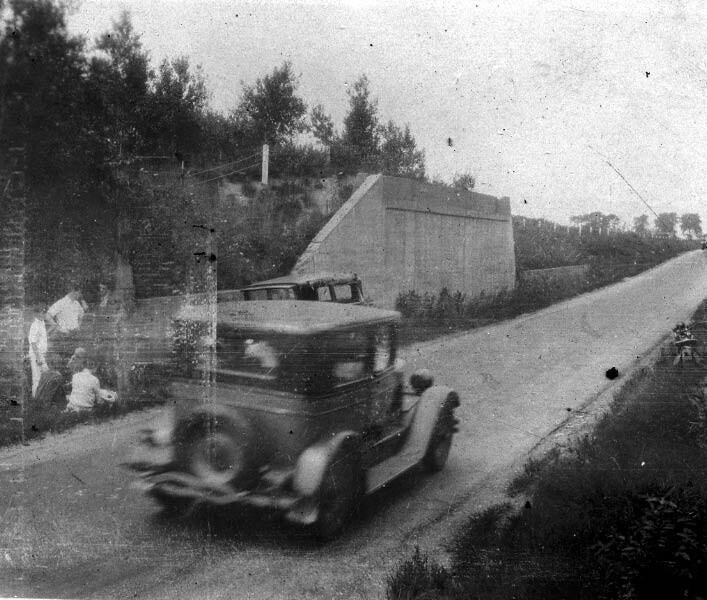 A simple test to the east abutment can verify the 1928 photo. Just need permission, a ladder, and latex gloves (thanks Art!). Motor Pkwy Police fact 1: If PO Zinzi received the accident call at home (Massapequa Lodge), he arrived at the scene in 7 1/2 minutes traveling 60mph. A passerby beat him to the scene and transported the injured to a nearby hospital. That’s pretty fast considering the parkway’s low traffic volume. Motor Pkwy Police fact 2: As determined by homeowner and NYPD detective Cloonan in the ‘50s, his home was previously a speakeasy of sorts. It would later become Rich Foran’s Hot Dog stand. I can definitely envision this location active during prohibition, with its quick in-and-out onto the parkway, the rumrunner’s choice for elusive and high speed delivery. The home today is an ordinary homestead, with no attachment to the past. Please respect the homeowners privacy.